Pregnancy is a good opportunity where NCD conditions such as diabetes, anaemia, obesity, cancer, strokes and hypertensive pregnancy disorders can be screened. While innovative practices for screening and management of NCDs are taking place in different regions of the country, experts look for a scalable and national level platform. The reduced Maternal Mortality Rate (MMR) figures for 2014-16 indicated that 30 more women were being saved in India as compared to 2013. The change was attributed to rising awareness about vaccinations and push for institutional deliveries. Even as India continues to make strides in reducing MMR that is defined as the proportion of maternal deaths per 1 lakh live births with 22 per cent reduction from 167 in 2011-13 to 130 in 2014-16 as per Sample Registration Survey (SRS) bulletin, the gaps remain when it comes to Non-Communicable Diseases (NCDs) that can develop due to child-birth related communications. In fact, women with diabetes, anaemia, obesity, cancer, stroke, hypertensive pregnancy disorders and other non-symptomatic NCDs account for almost 65 per cent of the deaths around the world, a majority of which occur in low and middle-income countries. Notably, cardiovascular disease is a leading cause of death in women. “The antenatal care is very well maintained by the government and the mortality rates are slowly decreasing which means that most of the causes of MMR were slowly under control. But there are conditions which might arise during pregnancy and continue even after delivery,” Dr. D. Praveen told Delhi Post. For example, in some cases of Gestational Diabetes Mellitus (GDM) during pregnancy, it gets converted into Type 2. It can be immediate or over a period of time. So, are there ways to prevent that from happening? “There are many such events that take place during pregnancy and can be prevented,” mentioned Dr. Praveen as he added, “Pregnancy is a good opportunity, a window where NCD conditions in the context of the future can be screened”. 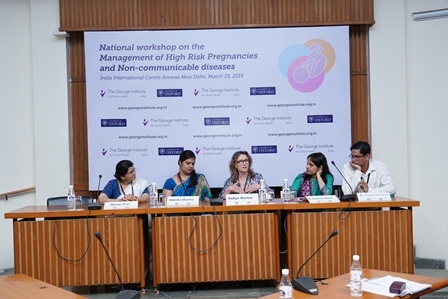 “However, lack of comprehensive data on NCDs still contribute to maternal deaths”, lamented Dr. Sumita Ghosh, Deputy Commissioner, Maternal Health, Government of India while discussing NCDs and high-risk pregnancies at the day-long ‘National workshop on the Management of High-Risk Pregnancies and NCDs’ organised by the George Institute for Global Health, India (TGI) recently. While the government’s major initiatives under National Health Mission (NHM) like augmentation of infrastructure and human resource, capacity building through Janani Shishu Suraksha Karyakaram, ‘Anaemia Mukt Bharat’, LaQshya and Janani Suraksha Yojana among others have helped, the long-term risks of pregnancy conditions continue to remain high. One of the reasons, Dr. Praveen, Program Head, Primary Healthcare, TGI, notes is once the delivery happens, despite the risks and complications, “the focus changes from the mother to the newborn/s”. “That is where mothers need to take care of themselves and test for glucose levels, diabetes etc,” he opined. That was how TGI’s Dr. Jane Hirst and Dr. Praveen led the SMARThealth Pregnancy programme, which aims to help community health workers identify women at risk and manage their healthcare in order to reduce maternal deaths. “Technology is not panacea. It is not a solution but an enabler to the existing health system. In the process, technology can add to development. We tried to understand what the system-level barriers are at the primary health centre level. While in some places, the physical facilities had to be improvised, in some, human resources were to be trained etc,” explained Dr. Praveen referring to the pilots conducted in West Godavari district of Telangana and Jhajjhar district of Haryana. Then TGI adopted paper-based algorithm into an app-based one. “This low-cost, smartphone-based system within the existing clinical set-up improves the screening, detection and management of adults with chronic diseases,” he shared. “The tablet-enabled app does not only help in screening but it helps in referring the patient for lifestyle advices, in providing management guidelines to the doctors and following up with the healthcare providers, which is the main gap in combating NCDs,” Dr. Praveen told Delhi Post. The Smarthealth system also offers multimedia resources, workshop training, remuneration incentives, recall and reminder system, interactive voice response, primary healthcare medication supply. “But on subsequent follow-ups, we would randomly come to know that the patient died. So, then, we shifted our focus to the long-term (at least a year) outcome of a near miss,” Dr. Aashima Arora from PGI shared with Delhi Post. PGI started to make near miss presentations (accumulated over the years) from 2014-15 till 2017 after which they applied to ICMR (Indian Council of Medical Research) to set up a near miss clinic in March 2018. “Any patient who is discharged with the tag of near miss is followed up for at least a year in regular intervals of three, six, nine months,” Dr. Arora explained to Delhi Post adding “grossly, we come to know what happens to women we are discharging”. The Government of Gujarat’s ImTeCHO (Innovative Mobile-phone Technology for Community Health Operators) mobile phone application which helps record data under better supervision is another example which has been implemented within the state’s primary healthcare system and relies on frontline workers. “The application provides ASHAs with their daily schedules and reminders of steps to be carried out. Also, the collected data and services offered are tracked,” explained A.V Sethraman from Argusoft India Ltd which is the IT partner for the application. Implemented in the Araku Valley, 111 kms from Andhra Pradesh’s Vishakapatnam is Asara, a project by non-profit Piramal Swasthya that offers a primary healthcare system to the scheduled tribal regions. Through door-to-door community outreach, specialist consultations, telemedicine and local nutrition resources at the community’s ‘Nutrition Hub’, the project is supplementing the state government’s efforts through collaboration with Integrated Child Development Services (ICDS) and the health department. Despite initiatives like these, many feel they are yet to come together and be scalable at the national level. “For longitudinal care of patients, creating awareness and coming together of such innovations for combating NCDs needs to happen together on a single platform and not in silos,” opined Malvika Sharma from Piramal Swasthya.